Being a developer and part time information security lecturer, I’m familiar with encrpytion-decryption methodology. I created a text file which stored all my login credentials and then encrypt it with a chain of encryption algorithms. If I forgot one of my login credentials, I should only supply a phrase which acts as master password, the software does the decryption process and all login credentials are now exposed. Nice, isn’t it? Yes, perhaps. It does solve problem with my absence in remembering passwords, but it doesn’t buy back 10 cal energy exerted for each username-and-password input process. This solution is also rather personal because not everybody can implement it. Technical knowledge is required and to know inside-out something technically is not everbody’s preference. A more generic and general approach is needed. Google use centralized login for all their services. Once user has been authenticated in a Google service, he/she will be automatically authenticated and authorized upon accessing other Google services. No redundant username/password reinput is needed. This can be achieved because the web application checks user’s state while requesting a new service. If a client is already authenticated, access to service is given. The checking process can occur if small signature/info is stored at client side. In this case, cookies are stored at client’s PC. With single login mechanism, authentication process now becomes easier. Now, user should only do authentication once to access all services offered. Less work and wrinkles. Yet, it’s not enough. Single login can only be valid for a single provider. Other providers may have their own single login mechanism. We still need more generic and general approach. Hmm… a bit vague definition. It deserves more explanation, nonetheless. The picture above shows sample network for classical authentication. 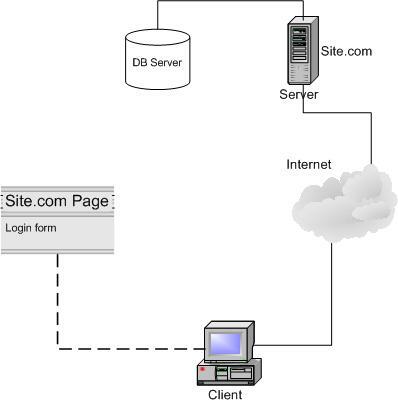 Client (name him John Doe) is browsing Site.com. A certain page contains private data which should be available only to registered users. A form which contains username and password (and probably CAPTCHA) is supplied to client. John will fill the form with him username and password. After submitting the form, the server will process the information. If a record is matched against the database, access is granted and private data can be accessed. 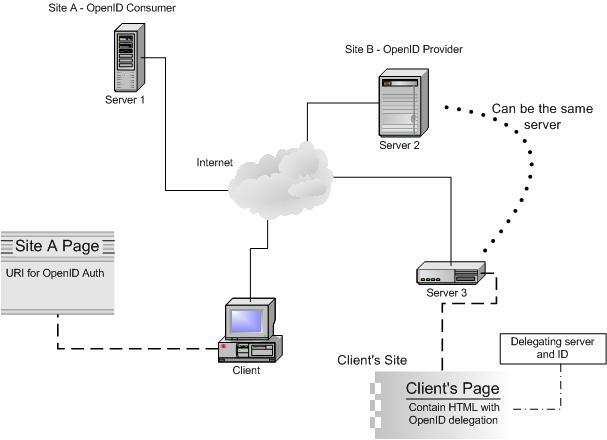 What makes OpenID authentication different? We’ll see another picture depicting sample network design for this type of authentication. John Doe is trying to access private data in Site A which is a step ahead of its competitor by providing OpenID authentication. John is prompted with a form containing single field to fill, ie his OpenID identity. John writes his claimed URL and then submit the form. The claimed URL can be owned by John or just a single page provided by OpenID provider which enables John to authenticate using provider’s server. In the claimed URL, there is extra header in the HTML which contain identity to be delegated and which server will authenticate the delegation or the OpenID server. Once this data is read, Site A will contact OpenID provider, asking if John is already logged in there. If he’s not, John will be prompted to provider’s authentication page to fill his credential (usually username and password in the provider’s site) and after successful login, John’s browser will be redirected back to Site A where he’s now able to access the private page. Err.. you said passwordless, but how can client authenticate at provider’s page? What input should be supplied? 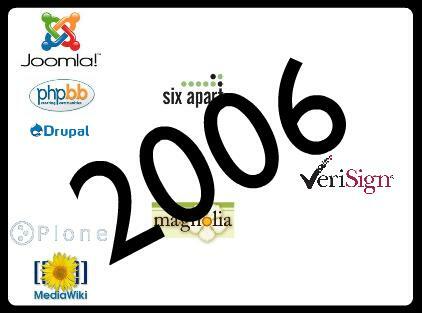 At this stage, we’re back with classical method, authentication with username/password registered at provider’s site. So, it’s not passwordless afterall? Yes, OpenID is not an account. It’s a mechanism to enable user authenticating him/herself by using a broker, ie OpenID identity provider, not directly at the site he’s currently visiting. This way, number of login credentials can be reduced to only one (or a few) provided by user’s pick of several OpenID providers. 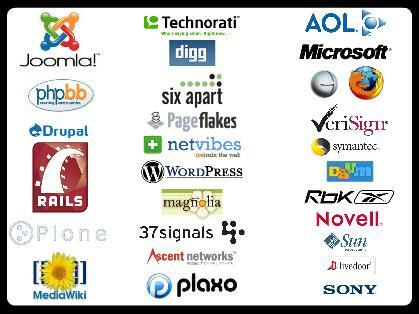 Thinking to deploy your own OpenID consumer after seeing above images? Is It All About Passwordless? Not yet. OpenID is not alone. 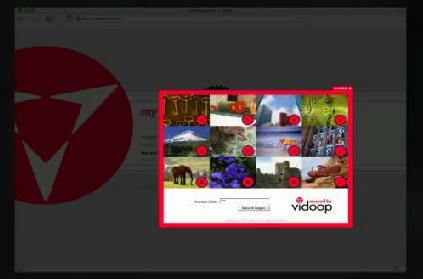 A new company named Vidoop has introduced their mechanism for authenticaion based on grid images. Basic idea for grid image authentication is visual imagery, assuming human is better in identifying and reckoning image than text. Probably true but I don’t think so. In the past I had seen similar approach offered by Spymac. They ask user to pick three icon images among others provided in a grid as password and then authenticate by clicking the icons in order user’s previously chosen. For me, that way is innovative. However, after several days of inactive login I totally forgot the icon order I pick, hence I got trouble in logging in. Spymac itself later disabled this authentication method and fell back to the conventional username/password. Anyway, for those interested in knowing more about this authentication, you can simply watch Vidoop’s video cast or read a review in Tech Republic by Jason Hiner.